Let us plant trees – many trees – millions of trees. So that this world will become a little bit greener and we can go on breathing. Forests are the “lungs of the earth” and at this very moment the lung is shrinking by 4.000 square meters per second. This is the size of 35 soccer grounds in one minute! Join us and help to preserve our nature, climate and do something for the people in the field. Here is the link between the virtual and the real world: for each virtual tree a real tree is planted. And some of the virtual trees are even special. There are trees for different occasions and even “prominent” trees can be planted. Much can be achieved together – with a lot of fun and above all with like-minded friends. Our long-term target: 1 billion trees. Possible? Together yes! Because: If each Facebook user plants one tree only, then there will be 1 billion trees already. And eventually each single tree will make a difference. To plant a tree does not only mean a tree to preserve the “lung of the earth, it means work, water, food and education for the people and a living environment for many animals. This is how we can accomplish something in the long run. Let’s go! Together let us make the world better and greener. I am looking forward to each one of you! 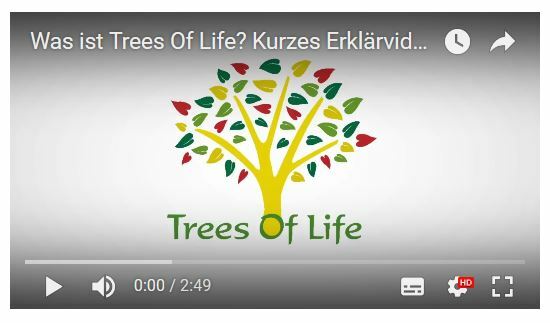 Click here for the video selection of Trees Of Life. Video messages are generally coming from the Trees of Life tree house.